Professor Gurgenci's current research interests include energy systems analysis; geothermal and concentrating solar thermal power plant technologies; development of intelligent tutoring and compterised assessment systems for teaching machine design. 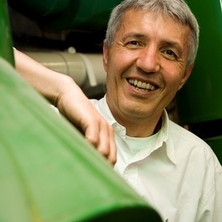 Hal Gurgenci, Professor of Mechanical Engineering, has many years of industry and academic experience in solar energy, manufacturing and mining. Professor Gurgenci is the Founding Director of the Queensland Geothermal Energy Centre of Excellence (QGECE). 2003 Engineering Excellence Award (Commendation) from the Institution of Engineers (Queensland) for the innovative design of a new mining machine technology (“Universal Dragline”). This technology is now being commercialised by the CRCMining spin-off Unidig and CRCMining partner P&H. 1986 Australian Design Award given to the design team for the design of the ICP Spectrometer product Plasmascan. Assessment and Comparison of Performance of Thermal and Electrical Battery for Renewable Energy Applications. Townson, P., Murthy, D.N.P. and Gurgenci, H. (2003). Optimization of Dragline Load. In Wallace R. Blischke and D.N. Prabhakar Murthy (Ed. ), Case Studies in Reliability and Maintenance (pp. 517-544) New Jersey, USA and Canda: John Wiley and Sons, Inc.
Qin, Guo-Jun, Hu, Niao-Qing, Guan, Zhi-Qiang and Gurgenci, Hal (2006) Novelty detection of longwall shearer based on cutting current index. Journal of Hunan University of Science and Technology, 21 2: 55-58. Kelly, M., Hainsworth, D., Reid, D., Caris, C. and Gurgenci, H. (2005) Longwall automation - An ACARP landmark project. AusIMM Bulletin, 2: . Liu, D., Gurgenci, H. and Veidt, M. (2004) Crack detection in welded mechanical structures using coupled vibrations. Acoustics Australia, 32 2004: 1-13. Hood, M., Gurgenci, H. and Hatherly, P. (2001) Aspects of mining R&D in Australia. CIM Bulletin, 94 1046: 71-75. Gurgenci, Hal (2010). Challenges for electrical power generation from EGS. In: Proceedings World Geothermal Congress 2010. World Geothermal Congress 2010, Bali, Indonesia, (1-5). 25-29 April 2010. Mostafa Odabaee, Hooman, Kamel and Gurgenci, Halim (2010). Entropy-energy analysis of metal foam heat exchangers as air-cooled heat exchangers. In: 3rd International Conference on Porous Media and its Applications in Science and Engineering ICPM, Montecatini, Italy, (). 20-25 June 2010. Odabaee, Mostafa, Hooman, Kamel and Gurgenci, Hal (2009). Comparing the Tube Fin Heat Exchangers to Metal Foam Heat Exchangers for Geothermal Applications. In: A. Budd, The 2nd Annual Australian Geothermal Energy Conference, Brisbane Australia, (). 11-13 November 2009. Gurgenci, Hal (2009). Electricity generation using a supercritical C02 Geothermal Siphon. In: Proceedings, Thirty-Fourth Workshop on Geothermal Reservoir Engineering. 34th Workshop on Geothermal Reservoir Engineering, Stanford University, CA, USA, (). February 9-11, 2009. Atrens, Aleks, Gurgenci, Hal and Rudolph, Victor (2009). Energy Analysis of a C02 Thermosiphon. In: Proceedings, Thirty-Fourth Workshop on Geothermal Reservoir Engineering. 34th Workshop on Geothermal Reservoir Engineering, Stanford University, CA, USA, (). February 9-11, 2009. Gurgenci, H., Rudolph, V., Saha, T. and Lu, M. (2008). Challenges for geothermal energy utilisation. In: 33rd Workshop on Geothermal Reservoir Engineering 2008, Stanford, U.S., (). 28-30 January, 2008. Hooman, K., Gurgenci, Halim and Dincer, Ibrahim (2007). Heatline and 'energy flux vector' visualization of natural convection in a porous cavity occupied by a fluid with temperature-dependent viscosity. In: K. Vafai, Second International Conference on Porous Media and its Applications in Science, Engineering and Industry, Kauai, Hawaii, US, (). 17-21 June 2007. Reid, A. W. and Gurgenci, H. (2006). A new longwall horizon control method. In: M. Hood, P. Lever and P. Knights, Proceedings of the Australian Mining Techology Conference. 2006 Australian Mining Technology Conference : 'Value through cost control', Cypress Lakes, Hunter Valley, NSW, (3-12). 26-27 September 2006. Liu, D., Gurgenci, H. and Veidt, M. (2005). Application of coupled vibration on detection of fatigue cracks in welded structures. In: , , (393-399). .
Liu, D., Gurgenci, H. and Veidt, M. (2005). Application of coupled vibration on detection of fatigue cracks in welded structures. In: M. Xie, A. Mouritz, A.A. Khatibi, C. Gardiner and W.K. Chiu, 4th Australasian Congress on Applied Mechanics. The Fourth Australasian Congress on Applied Mechanics, Melbourne, Australia, (393-400). 16-18 February 2005. Reid, A. W. and Gurgenci, H. (2005). Application of shaping filters. In: H Gurgenci, M Hood, P Lever and P Knights, 2005 Australian Mining Technology Conference - New Technologies to Produce More with Less. Proceedings of the 2005 Australian Mining Technology Conference, Freemantle, Western Australia, (29-40). 27-28 September 2005. Gurgenci, H., Williams, D. J., Kouzani, A and Groenland, R (2005). Haul Road Dust Suppression. In: H Gurgenci, M Hood, P Lever and P Knights, 2005 Australian Mining Technology Conference - New Technologies to Produce More with Less. Proceedings of the 2005 Australian Mining Technology Conference, Freemantle, Western Australia, (231-238). 27-28 September 2005. Kelly, M., Hainsworth, D., Reid, D. J., Caris, C and Gurgenci, H. (2005). State-of-the-Art in Longwall Automation. In: Hal Gurgenci, Mike Hook and Paul Lever and Peter Knights, 2005 Australian Mining Technology Conference "New Technologies to Produce More with Less". 2005 Australian Mining Technology Conference "New Technologie", Fremantle, Western Australia, (139-147). 27-28 September, 2005. Liu, D., Gurgenci, H. and Veidt, M. (2004). Assessment of structural integrity through coupled vibration. In: Atrens, A., Boland, J. N., Clegg, R. and Griffiths, J. R., Proceedings of the Structura Integrity and Fracture International Conference (SIF'04). Structural Integrity and Fracture International Conference (SIF'04), Brisbane, Australia, (221-227). 26-29 September, 2004. Liu, D., Gurgenci, H. and Veidt, M. (2004). Detection of fatigue cracks in boom structures using coupled response measurements. In: H. Gurgenci, A. Hall, D. Howarth, P. Lever, T. Meyer and E. Nebot, Proceedings of the 2004 CRCMining Research and Effective Technology Transfer Conference. CRCMining Conference, Noosa Head, Queensland, Australia, (1-8). 15-16 June 2004. Gurgenci, Halim (2004). Improving Longwall Face Equipment Reliability. In: Proceedings of: Longwall 2004. Longwall 2004, Hunter Valley, New South Wales, Australia, (1-15). 25-27 October 2004. Reid, A. W. and Gurgenci, H. (2004). Modelling the dynamics of longwall shearers. In: H Gurgenci, A Hall, D Howarth, P Lever, T Meyer and E Nebot, Proceedings of the 2004 CRCMining Research and Effective Technology Transfer Conference. CRCMining Conference, Noosa Head, Queensland, Australia, (1-8). 15-16 June 2004. Liu, D., Gurgenci, H. and Veidt, M. (2003). Crack detection in welded mechanical structures using coupled vibrations. In: Joseph Mathew, Proceedings of the 10th Asia-Pacific Vibration Conference. Asia-Pacific Vibration Conference, Gold Coast, Australia, (408-413). 12-14 November 2003. Bongers, D. R. and Gurgenci, H. (2002). Development of a training set for fault detection in Longwall Mining. In: P. Pemberton, M. Turner, I. Jacobs and ., The 5th Biennial Engineering Mathematics and Applications Conference. The 5th Biennial Engineering Mathematics and Applications Conference, The University of Technology, Brisbane, (91-95). 29 September - 2 October 2002. Liu, D., Gurgenci, H. and Veidt, M. (2001). Crack identification in hollow section structures through coupled response measurements. In: Proceedings of SPIE: The International Modal Analysis Conference - IMAC. 19th International Modal Analysis Conference, Kissimmee, Florida, (199-206). 5-8 Feb 2001. Gurgenci, H. (2000). Dragline duty meter-maintenance based on severity of duty. In: Proceedings of the International Maintenance Management Conference. International Maintenance Management Conference, Sydney, Australia, (). 13-14 November, 2000. Horton, C., Gurgenci, H., Veidt, M. and Friswell, M. (2000). Finite element model updating of a welded space frame. In: Proceedings of the 18th International Modal Analysis Conference on Structural Dynamics. 18th International Modal Analysis Conference on Structural Dynamics, San Antonio, Texas, USA, (529-535). 7-10 February, 2000. Horton, C., Gurgenci, H., Veidt, M. and Friswell, M. I. (1999). Finite element model updating of the welded joints in a tubular H-frame. In: IMAC-XVII: Proceedings of the Modal Analysis Conference. Modal Analysis: Reducing the Time to Market, Hyatt Orlando Hotel, Kissimmee, FL, (1556-1562). 8-11 February 1999. Horton, C., Gurgenci, H., Veidt, M. and Friswell, M. I. (1999). Finite element model updating of the welded joints in a tubular H-frame. In: Hal Gurgenci and Jimin He, International Conference on Applications of Modal Analysis '99: Recent Advances in Modal Analysis Practice. Recent Advances in Modal Analysis Practice, Gold Coast, Queensland Australia, (309-335). 15th - 17th December, 1999. Gray, D. and Gurgenci, H. (1999). Modal analysis of skis and snowboards. In: Hal Gurgenci and Jimin He, International Conference on Applications of Modal Analysis '99: Recent Advances in Modal Analysis Practice. Recent Advances in Modal Analysis Practice, Gold Coast, Qld, Aust., (368-376). 15-17 Dec 1999. Jenkins, D. M., Gurgenci, H. and Morrison, W. R B (1993). Relationship between static and dynamic burst pressures of sheet steel diaphragms. In: Proceedings of the 1st Conference on Dynamic Loading in Manufacturing and Service, , , (25-31). February 9, 1993-February 11, 1993. Gurgenci, H., Yildirim, T., Kakac, S. and Veziroglu, T. N. (1986). PRESSURE-DROP AND DENSITY-WAVE INSTABILITY THRESHOLDS IN BOILING CHANNELS. In: Selection de Communications au Symposium AIRH: L'Approche Stochastique des Ecoulements Souterrains., , , (). .
Ozakcay, L. and Gurgenci, H. (1986). Feasibility of solar pond power generation in outback Queensland - Australia. In: Intersol 85, Proceedings of the Ninth Biennial Congress of the International Solar Energy Society. Ninth Biennial Congress of the International Solar Energy Society., Montreal, Que, Canada, (1510-1514). 23-29 June 1985. Ortabasi, U., Gurgenci, H. and Selcuk, M. K. (1984). STAND-ALONE PARABOLIC DISH POWER PLANTS TO PROVIDE ELECTRICITY TO ISOLATED SINGLE RESIDENCES IN REMOTE AREAS OF AUSTRALIA. In: Solar World Congress, Proceedings of the 8th Biennial Congress of the International Solar Energy Society., , , (1648-1652). .
Ortabasi, U. and Gurgenci, H. (1983). OVERVIEW OF SOLAR PONDS FOR PROCESS HEAT AND POWER GENERATION. In: International Symposium-Workshop on Renewable Energy Sources., , , (87-137). .
Mentes, A., Gurgenci, H., Yildirim, O. T., Kakac, S. and Veziroglu, T. N. (1982). EFFECT OF HEATER SURFACE CONFIGURATIONS ON TWO-PHASE FLOW INSTABILITIES IN A VERTICAL BOILING CHANNEL. In: Proceedings of Condensed Papers - 16th Southeastern Seminar on Thermal Sciences., , , (71-72). .
Lin, Z. H., Veziroglu, T. N., Kakac, S., Gurgenci, H. and Mentes, A. (1982). HEAT TRANSFER IN OSCILLATING TWO-PHASE FLOWS AND EFFECT OF HEATER SURFACE CONDITIONS. In: Heat Transfer 1982, Proceedings of the 7th International Heat Transfer Conference. Volume 6: General Papers: Combined Heat and Mass Transfer, Particle Heat Transfer, Heat Exchangers, Industrial Heat Transfer, Heat Transfer in Energy Utilization., , , (331-336). .
Gurgenci, H., Veziroglu, T. N. and Kakac, S. (1982). PRESSURE-DROP AND DENSITY-WAVE INSTABILITY THRESHOLDS IN BOILING CHANNELS. In: Proceedings of Condensed Papers - 16th Southeastern Seminar on Thermal Sciences., , , (73-74). .
Gurgenci, H., Veziroglu, T. N. and Kakac, S. (1982). SIMPLIFIED NONLINEAR DESCRIPTIONS OF TWO-PHASE FLOW INSTABILITIES IN A VERTICAL BOILING CHANNEL. In: Proceedings of Condensed Papers - 16th Southeastern Seminar on Thermal Sciences., , , (144-145). .
International Conference on Applications of Modal Analysis '99: Recent Advances in Modal Analysis Practice (1999) . Edited by Gurgenci, H. and He, J.. Recent Advances in Modal Analysis Practice, 15-17 Dec 1999, Gold Coast, Qld, Aust..
Hooman, Kamel and Gurgenci, Halim (2008) Heatline visualization of natural convection in a porous cavity occupied by a fluid with temperature-dependent viscosity. Hooman, Kamel and Gurgenci, H. (2007) Effects of viscous dissipation and boundary conditions on forced convection in a channel occupied by a saturated porous medium. Note for students: Professor Hal Gurgenci is not currently available to take on new students. Improving the performance of air-cooled condensers by using metal foams.